ATLANTA, Georgia (CNN) -- Federal investigators trying to determine why a Delta Air Lines jet landed on a taxiway instead of the runway in Atlanta on Monday morning say the runway was illuminated, but that approach lights and a ground-based instrument that helps pilots line up with the runway were off. 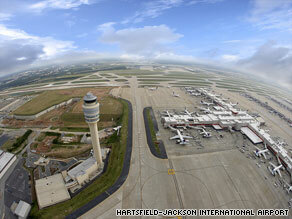 The incident happened at Atlanta Hartsfield-Jackson International Airport, the world's busiest. But it occurred shortly before dawn, when airport operations are slow. Delta Flight 60, from Rio de Janeiro, Brazil, was cleared to land on a main runway around 6:05 a.m., but it landed instead on nearby Taxiway M, which runs parallel to the runway, said FAA spokeswoman Kathleen Bergen. The departure taxiway, which can be filled with aircraft during peak hours, was empty at the time, and the plane landed safely, officials said. No one was injured, and there was no damage to the taxiway. The Boeing 767 aircraft had 182 passengers and a crew of 11. The FAA, the National Transportation Safety Board and Delta Air Lines are investigating. The pilots of the aircraft were placed on nonflight status, Delta said. The NTSB on Wednesday confirmed that a "check pilot" on the flight was sick, and the crew had declared a medical emergency. It was not clear what, if any, role that played in the mishap. Sources familiar with the incident say that Flight 60 originally was scheduled to land on Runway 27L (left), the active runway at that time, but was "sidestepped" to Runway 27R (right). Pilots commonly ask to be "sidestepped" to Runway 27R -- and air traffic controllers commonly offer 27R -- because it is closer to the terminal and pilots can shave minutes from a trip. In this case, it is not clear whether the pilot made the request, or the air traffic controllers made the offer. Nor is it clear why the change was made -- whether to shave time from the flight, or because of the medical emergency on the aircraft or some other reason. But after being given permission to land on Runway 27R, the plane went too far to the right, landing on Taxiway M.
The runway was marked with yellow lights, while the taxiway was marked with blue lights, one person familiar with the incident said. The NTSB said the runway lights on 27R were illuminated, but a "localizer" and approach lights for the runway were off. Officials said the weather at the airport was clear, and the NTSB said the wind was calm at 10 mph. The sky was dark, with twilight still more than an hour away. The NTSB said a "check airman" was in the cockpit with the captain and first officer during the flight, but became ill and moved to the cabin for the remainder of the flight. Check airman are company pilots who watch over crew members during significant flights, such as when a first officer becomes a captain, when a pilot is making a maiden international flight, or over mountainous terrain for the first time. The NTSB said it is uncertain why the check airman was on the Delta flight. Delta spokesman Anthony Black said the airline is cooperating with the FAA and the NTSB and conducting its own investigation. The pilots of the flight have been relieved from active flying, he said. The incident came just two weeks after the FAA announced that serious runway incursions were down 50 percent this year. Close calls in 2007 at some of the busiest U.S. airports prompted the FAA to take action to reduce the risk of runway incursions and wrong runway departures. There were 24 serious runway incursions that year, eight of them involving commercial carriers. All About Hartsfield-Jackson Atlanta International Airport • U.S. National Transportation Safety Board • Delta Air Lines Inc.